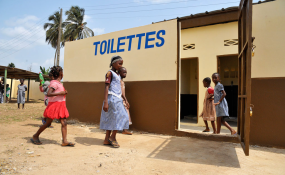 More people have access to mobile phones than toilet facilities in Nigeria, UNICEF's Chief of Water Sanitation and Hygiene (WASH), Zaid Jurji, has said. Speaking yesterday at a two-day media dialogue on European Union (EU) Niger Delta Water Project in Port Harcourt, River State, Zaid said it is important for Nigeria triple her investment in water sanitation and hygiene to achieve the SDG water and sanitation target of 2030. Quoting the Nigerian Communication Commission (NCC) report released in January 2018, Zaid said 140 million Nigerians have access to telephone facilities while only 97 million have access to toilets facilities. He added that though people need cell phone because it has improved a lot in the area of communication, hygiene is most important to environmental and human health. Zaid also said Nigeria remains number one country in Africa in the practise of Open Defecation, adding that investment in WASH is profitable for all. "The real cost of Open Defecation in Nigeria are disease and death, stunting, wasting, and malnutrition, loss of dignity, privacy and security, reduced school attendance, productivity and loss of GDP," he said. He further said N234 billion is needed from the government for the realisation of Open Defecation Free zone in Nigeria while adding that poor government and counterpart funding has been threatening WASH projects across the country. Copyright © 2018 Daily Trust. All rights reserved. Distributed by AllAfrica Global Media (allAfrica.com). To contact the copyright holder directly for corrections — or for permission to republish or make other authorized use of this material, click here.